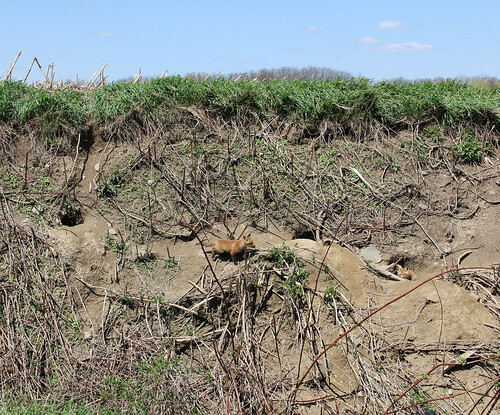 Earlier this spring they cut down the brush in all the ditches on our country road... doing this exposed an active fox den with 8 kits! We've been watching them mature over the last month, and finally yesterday, I had my camera with me when they were out. They were in a particularly brazen mood, and I was laughing out loud while they chewed, stepped on, and played with one another! Insanely cute, right? I've had foxes on the brain ever since I read about domesticated foxes this winter in National Geographic. Did anybody else read that article? After reading it I found out that one can even buy a fox of their very own from Russia. No worries, though, I am more than happy to watch these little guys grow from afar.... I think my cat would eat it if I brought one home : )! Happy Mother's Day to those of you who celebrate... I have been really enjoying reading this website which explains the history of Mother's Day. If you have a moment check it out... truly enlightening!!!! Or it might eat your cat! 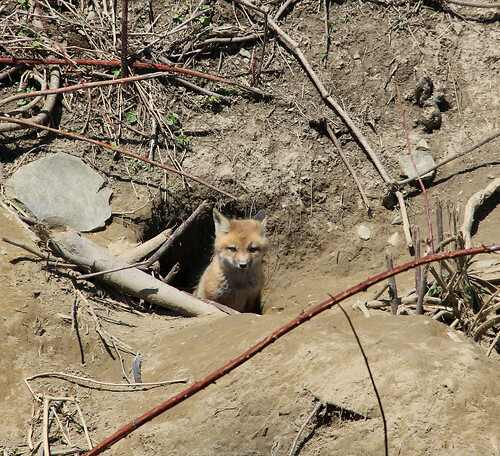 We've got red fox by us too, though the siting are very rare they're also a pleasure. I read that article -- WANT one! 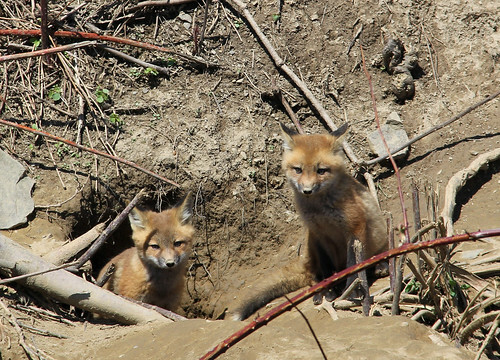 Great pics of 'your' foxes! glad the clearing didn't chase them out of their den. eat your cat, or attack your child. although cute they are very dangerous. My daughter and a couple of her girlfriends were at the neighbors, jumping on a trampoline (luckily with the netting around it so they couldn't fall off) and a fox jumped on the trampoline and was visciously biting and clawing at the netting to get to the kids. luckily the mom peaked out the window and saw what was going on, went running out with a broom, and the dog and the fox disappeared... so please be very careful. Thanks for your comments All! 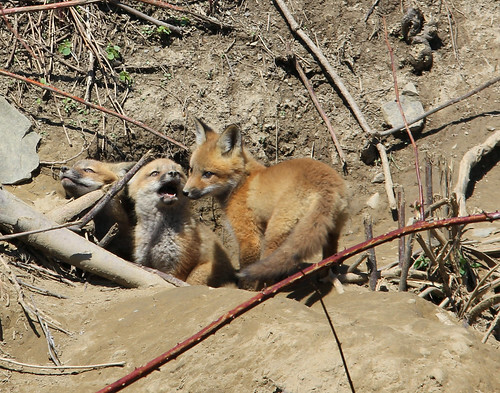 These are red foxes... I forgot to mention that : )! And no worries Melanie, they are quite a ways down the road from us... and all of these pics were taken from my car. I feel very strongly about respecting their space and not interacting with them. Thanks for the warning! 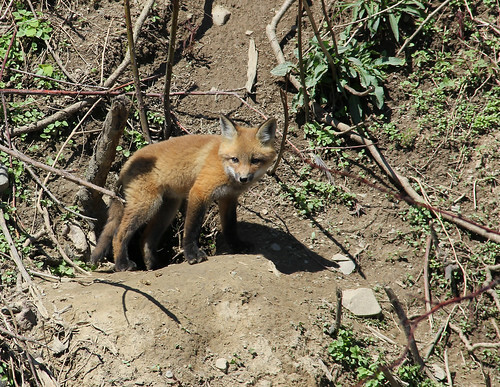 We have quite a few foxes around here but with my 50mm lens I never get close enough to get any good photos. . . .and happy Mother's Day to you too! Oh, the cute! I read the article at the vet's office. One of my Border Collies looks like a black and white fox. Oh they're so cute! Great shots. Don't you just want to scratch them between their ears? Aaaawwwwwwwww. I love foxes as well. I occasionally see them driving around at night but would love to have a family I could watch grow.